Despite being barely three miles from the centre of Norwich, and a stone's throw from the new A47, St Andrew at Whitlingham is rather hard to find, because there is not access to it from either of them. Rather, you need to head down the lane that runs opposite Trowse Newton church for about three miles, which becomes a track through the country park. Right at the end, St Andrew stands high on a ridge above the river Yare - or, at least, some of it does. Some lies at the bottom of the slope, covered in moss, while some has presumably been carted away to be used as building rubble. We know more about its history than many lost churches. That it was round towered can be seen in this 19th century postcard of the ruin, donated by Martin Balls. A bequest in the 1520s left money for building an octagonal belfry stage at the top of the round tower, but judging by the photograph this was not built. After the Reformation, the building seems to have been used less frequently, possibly even actually allowed to ruin - which is curious, since the window tracery on the south side of the chancel is certainly Victorian. This is the side you can see above, and I wondered if this 19th century tracery could have been enthusiastic gothicisation to create a view. James Noyes contacted me to note that this window tracery was a feature added to what was already a ruined church in the nineteenth century, in order to make it more picturesque. Whitlingham was a favourite romantic walking-spot in the 18th century for the city-folk, says James, including the Norwich School of painters. The church was therefore preserved as an ideal aesthetic focal point. One night in 1940 the tower collapsed into the church, probably a result of being undermined by land slipping away on the north side. All that remains of the tower today is a mound, and none of the north side survives at all. 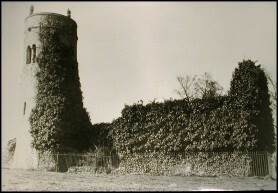 The photograph at the top is taken from almost exactly the same place as the postcard - the tower buttress on the far left was under ivy in the 19th century. The south wall of the chancel stands, with two windows, and part of the south wall of the nave. As well as the mysterious 19th century window, there is a pretty piscina, and beside it the sedilia window has apparently been filled up except for the tracery at the top. Pevsner's revising editor Bill Wilson claims to have seen the east window tracery, but either it has disappeared recently or he didn't come and check. A couple of points of interest are the brick built chancel arch - you can still see the frill of decoration - and a 19th century graffito on the south-west corner of the nave. This must have been a very lonely place until five years ago. Then, the A47 dual carriageway between the Midlands and Yarmouth was put in, shattering the peace. James Noyes tells me that he wrote to the County Council in a vain attempt to convince them to redirect the proposed dual-carriageway because of this church site. The official in charge claimed the church was predomintantly Victorian (therefore of less architectural value); James pointed out the piscina as proof that it was an important mediaeval monument. But it was to no avail, and the bypass was built next to the site, ignoring the protests of the inhabitants of Postwick and ruining the once-delightful village of Intwood. However, it does make access to the site easier, because the locked gates that guard an access route from the lane up to the verge of the dual carriageway also take you to the flat area to the south of the church - presumably it was used during construction of the road to store materials, because there are now no older trees or bushes here. The man who lives in the cottage in the lane observed us trying the more difficult route up the north slope, and advised us on the better way. Presumably he has had to dial for an ambulance once too often. I am encouraged that, despite the obscurity of this church, it generates a fair amount of correspondence, certainly as much as some of Norfolk's more famous churches. People seem to have a fascination with it. It remains a difficult spot to get to, and spoilt a little by the thunderous traffic of the A47.